Rally Sweden provided a host of challenges for Robert Kubica and Maciej Szczepaniak. Contesting the snow-covered stages for the first time behind the wheel of their RK M-Sport World Rally Team Ford Fiesta RS WRC, the week was not without incident. Despite finishing the event in 24th place, the Pole was able to develop his knowledge and experience of the unfamiliar surface. As the FIA World Rally Championship’s only true winter rally, the chance for a driver to test his skills on snow comes around just once a year. Continuing to advance as one of the series’ most promising up-and-coming talents, it was paramount that Kubica made it through all 24 speed tests. Mission accomplished, he made the most of the opportunity – discovering the limits and characteristics of the specialist stages. 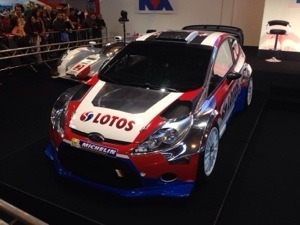 Having made a strong start, Kubica was on course for a points-paying finish. Unfortunately, his hard work was undone through the second pass of Friday’s classic stages. Becoming engulfed in the soft snow banks, the Pole twice lost 10 minutes to the leaders having to free his Fiesta from their grasp. Yet determined to improve, he wasn’t going to let the elements stand in the way of his discovering all that the stages had to offer. The popular Pole faced a new challenge over the final day of competition. Running as the first car on the road, Kubica had to contend with the rally’s most challenging conditions. Far removed from the event’s traditional hard ice and compacted snow, unpredictable grip and treacherous corners were the order of the day. Despite losing another three minutes with a third brush with the white barriers, the Pole instrumented a steady improvement in pace. Bringing his Fiesta home, Kubica may not have achieved the points-paying position he was capable of, but the knowledge and experience gained will be invaluable in years to come. Another fresh challenge now waits. Bidding farewell to Sweden’s cold climate, Kubica will next tackle the blistering heat and high-altitude of Rally Mexico’s gravel tracks in three weeks’ time. “Finally we got to the end, that was our target but unfortunately without mistakes. I made a stupid mistake yesterday with an awkward landing after a jump. After that it became even more difficult. I made two mistakes which were a little bit crazy. By driving slowly and carefully I don’t drive like I should be and have more moments and more mistakes than when I’m driving fast. “It’s been a really difficult event, and I’ve gained a lot of experience which can only help us in the future. I have to say that I was looking forward to finishing this rally, and we have done that. Of course not in the way we would have liked to, but a finish is a finish and the experience is the same.